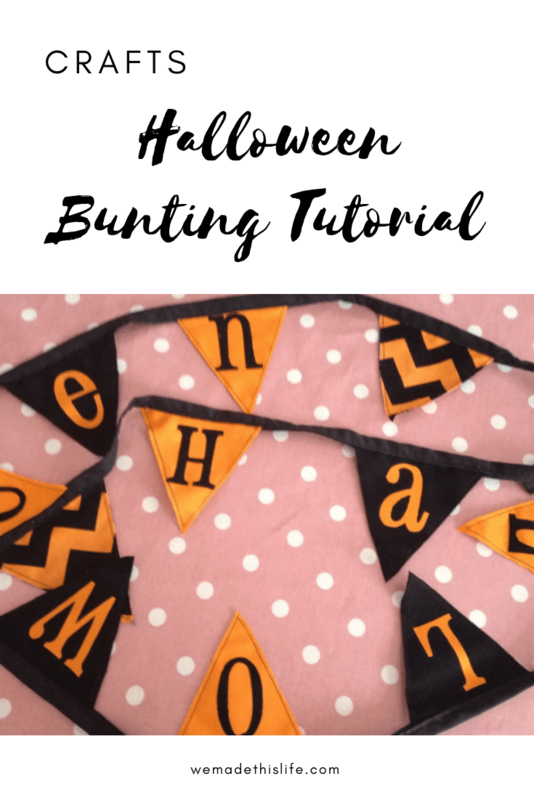 Who doesn’t love a bit of bunting and this Halloween bunting tutorial is a perfect project for this time of year! Firstly I cut a cardboard bunting triangle template. Mine was cm tall by cm wide. I then printed the word “halloween” in a large size onto cardboard and cut the letters out to use as templates for my appliqué. I folded my fat quarters of fabric until they were about the same height as my triangle and used the template to cut all the fabrics apart from one end piece of the black and one of the orange to make the appliqué letters. Basic appliqué tutorial here). Once the letters were appliquéd on I sewed two triangles together – wrong sides together so that the bunting was double sided – one side with wording and the other plain. I then attached the triangles to some double fond bias binding by slipping them in the middle fold and pinning in place. I made sure the triangles were evenly spaced. Then I sewed one long line of straight stitch to secure all the triangles in place. Make sure a little is left on the end for trying it up. Mine was 2.5 metres long – perfect to adorn a wall or the banisters like in my house!